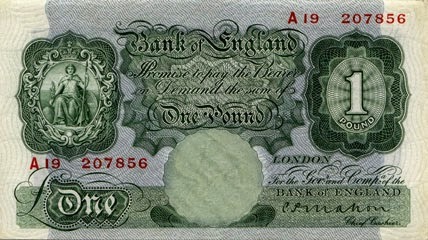 A £1 note from the 1930s. When German spy Josef Jakobs parachuted into a farm field near the village of Ramsey in England, he carried upon his person a small fortune in British currency. Members of the Home Guard who searched him the following morning found wads of new and old £1 notes tucked away in his wallet and various pockets. The Ramsey Police counted the notes several times and came up with a total of £497 or £498. Today, that amount would be the equivalent of about £22,000. Det. Sgt. Oliver Mills noted that several of the notes looked like forgeries to him. Several MI5 officers noted that Josef Jakobs was, up until that point, the highest paid agent to land in Britain. That fact only made them think that he was highly valued by the German Abwehr. Other German agents had generally arrived with £200 or less. Josef steadfastly maintained that he had been given more money than other agents because the previous amounts were deemed to be inadequate. He denied that he was to deliver the money to another agent in England. In the end, MI5 believed at least that part of his story. At one point, interrogation officers told Josef that the bank notes were forgeries, but that was probably a ruse used to shake his confidence in the German Abwehr who had supplied him with the money. While the MI5 officers examined many of the objects brought by Josef, the bank notes were never brought under intense scrutiny. A £1 wartime issue note from the 1940s. At Josef's court martial, Col. William Edward Hinchley Cooke, the public face of MI5 testified that the bank notes found in Josef's possession had been deposited with the Bank of England but could be produced upon request. 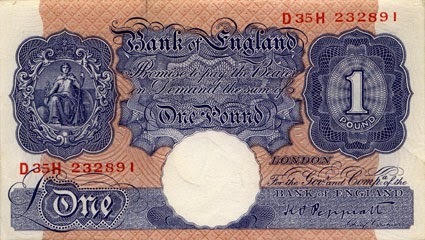 While the bank notes found in Josef's possession were probably not forgeries, other German agents were supplied with forged Bank of England notes. In the early years of the war, Nazi Germany embarked on an ambitious currency counterfeiting plan, their goal was to destabilize the British pound. Operation Andreas operated out of Charlottenburg in Berlin and after much trial and error figured out the correct formula for the paper product used by the Bank of England. Drawing upon a small army of Jewish typographers, illustrators, painters, retouchers, chemists, engravers, pressmen, bookbinders, bank workers and forgers, the Nazis set to work. The only hiccup in the plan was that the counterfeiters had to use existing serial numbers of authentic banknotes. Forged £5, £10, £20, £50, £100 and £500 notes were produced but would they pass inspection? A set of forged notes was sent to a bank in Switzerland under a cover story. The Swiss bank concluded that the notes were genuine. Still unconvinced, the Germans asked the Swiss to pass the notes by the Bank of England which concluded that 90% of the forged notes were genuine. Produced in preparation for the invasion of England, the counterfeiting program was put on hold after the invasion never materialized. In 1942, a second program, Operation Bernhard took up the baton and moved the counterfeiting operation to Sachsenhausen Concentration Camp north of Berlin. In the end, Operation Bernhard produced £130-million in fake British currency, about 10% of the total in circulation. The fake British notes eventually destroyed confidence in the Bank of England notes overseas. Eventually all of the Bank of England notes above £5 were recalled and new ones issued. The story Operation Bernhard is told in the movie The Counterfeiters, winner of the 2007 Oscar for Best Foreign Language Film. While it is clear that Nazi Germany did have a large-scale counterfeiting operation, there is no evidence that they produced counterfeit £1 notes. The notes that Josef Jakobs brought to England were legitimate, probably gleaned from transactions in various neutral countries, most likely Portugal and Spain. National Archives, Security Service files on Josef Jakobs - KV 2/24, 2/25, 2/26, 2/27. MI5 Files: Nazi Plot to Destroy British Currency with Forgeries, The Telegraph, Feb 17, 2012. A Nazi Counterfeit in the National Bank - Museum of the National Bank of Belgium. Operation Bernhard - British Notes website. Operation Bernhard & Devil's Workshop - British Notes website.